Contents: Preface. 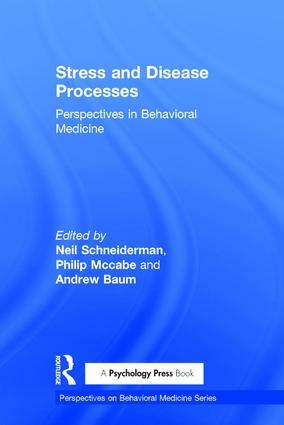 L. Schneiderman, A. Baum, Acute and Chronic Stress and the Immune System. J.A. Moynihan, N. Cohen, Stress and Immunity. A.A. Stone, Selected Methodological Concepts: Mediation and Moderation, Individual Differences, Aggregation Strategies, and Variability of Replicates. F. Berkenbosch, Corticotropin-Releasing Factor and Catecholamines: A Study on Their Role in Stress-Induced Immunomodulation. R. Ader, Behavioral Responses to Cyclophosphamide in Animals with Autoimmune Disease. M.R. Irwin, Depression and Immunity: Central Corticotropin-Releasing Factor Activates the Autonomic Nervous System and Reduces Natural Killer Cell Activity. N. Klimas, R. Morgan, F. Salvato, F. Van Riel, C. Millon, M.A. Fletcher, Chronic Fatigue Syndrome and Psychoneuroimmunology. M.H. Antoni, N. Schneiderman, A. LaPerriere, L. Bourguignon, M.A. Fletcher, Psychoneuroimmunology and Stress Responses in HIV-1 Seropositive and At-Risk Seronegative Gay Men. S.M. Levy, D.C. Roberts, Clinical Significance of Psychoneuroimmunology: Prediction of Cancer Outcomes. E.C. Suarez, R.B. Williams, Jr., Interactive Models of Reactivity: The Relationship Between Hostility and Potentially Pathogenic Physiological Responses to Social Stressors. J.S. Skyler, J.B. Marks, N.E. Thompson, M.D. Fili, N. Schneiderman, Insulin Sensitivity and Blood Pressure. B. Falkner, S. Hulman, H. Kushner, Insulin Resistance as a Determinant of Cardiovascular Reactivity. R.S. Surwit, Glycemic Responsivity to Adrenergic Stimulation and Genetic Predisposition to Type II Diabetes. A.M. La Greca, Psychosocial Aspects of Childhood Diabetes: A Multivariate Framework. S.B. Johnson, Compliance and Control in Insulin-Dependent Diabetes: Does Behavior Really Make a Difference?